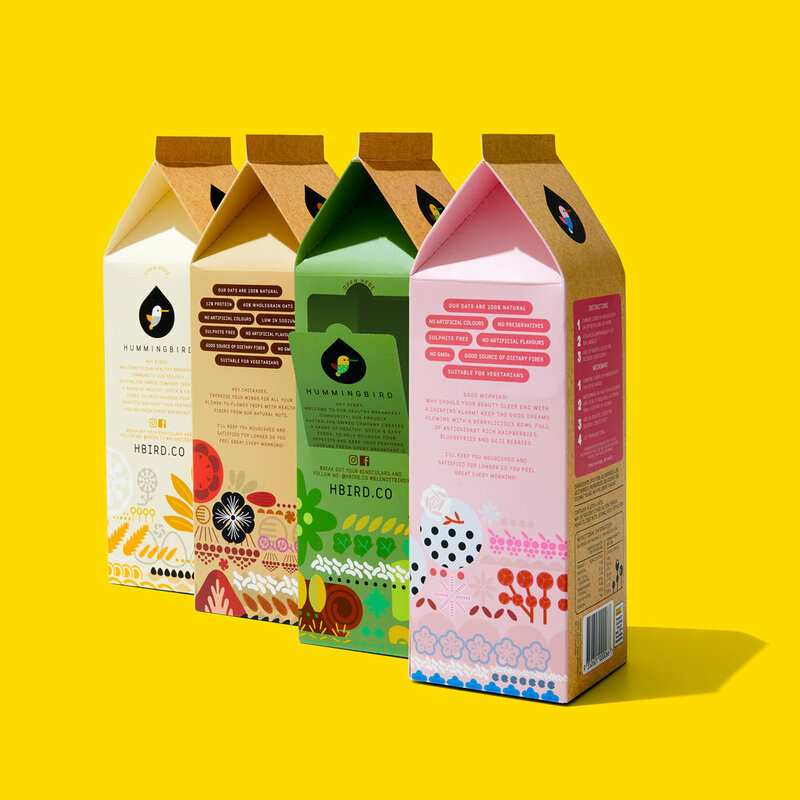 By crafting and designing a milk carton, TABOO takes a route less traveled with Hummingbird's new line of porridge. Each package features a different color bird and unique animated take of the ingredients based on the flavor. Additionally, there is a good morning message featured on the back that is guaranteed to start your day with a smile. "A tall classic milk carton shape (250g) including five individually wrapped sachets inside (50g each). Each product from the range has a unique illustration design yet remains consistent with the brand’s look and feel. TABOO had previously developed Hummingbird, inspired by the chirpy, bright-eyed and fun creature - the hummingbird. Hummingbird again engaged TABOO, to continue the evolution of their design, personality and language and fly into a new product category – Porridge. " 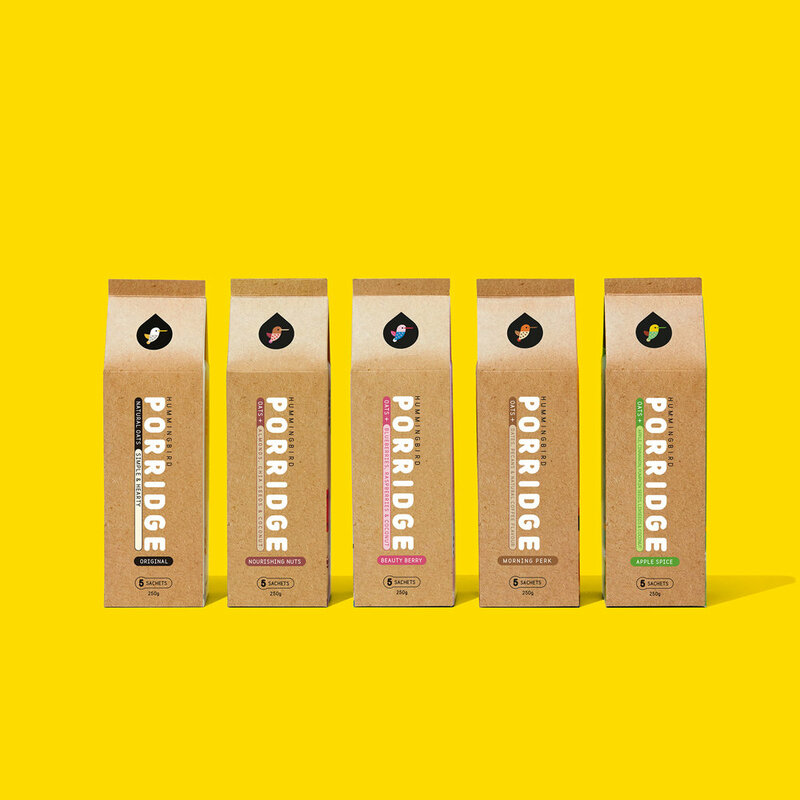 "Objective: Break category-packaging conventions and extend our brand offering into a new world. Leverage the brand’s minimal, fashionable and fun aesthetic to catapult Hummingbird into 40% of Australian households." "Market: The target audience includes communities that are city-livers, have an extremely busy lifestyle and strongly value their time, good health & wellbeing. The primary audience is 20-35y.o females and the secondary target audience is 20-35y.o females & the secondary target audience is males (20-35y.o) & females (35-46y.o). Creative Solution: A clean colourful design, in a packaging shape that breaks from convention and sticks out amongst competitors on the shelf. A strong, fun and fashionable illustration style inspired by minimal Japanese packaging and patterns is unique to each SKU."